Former vice president Emmerson Mnangagwa is under pressure from his allies and Zanu PF’s rivals to join the ranks of opposition politics. In the aftermath of his expulsion, allies are advising him to join hands with opposition leaders such as Morgan Tsvangirai of the MDC, and former vice president Joice Mujuru, to build a stronger rival to Zanu PF. Mujuru, Mnangagwa’s most immediate predecessor, said the former Justice minister should join her in the trenches to stop the creation of a Mugabe dynasty, referring to the current push to have the former vice president replaced by First Lady Grace Mugabe. Mujuru was expelled from Zanu PF in 2014 on similar allegations of trying to topple Mugabe, who has led the country since independence in 1980. She was replaced by Mnangagwa, who could not last long in that position. “Mnangagwa sir and with due respect, it is time to redeem yourself and walk out on this falling dynasty. Together we can build another great Zimbabwe not driven by love for power and money but genuine love and commitment to one’s country,” said Mujuru, speaking through her spokesperson, Gift Nyandoro. Already, there are efforts to form an Alliance of opposition parties to dislodge Mugabe from power. Tsvangirai is leading the MDC Alliance, while Mujuru, the National People’s Party (NPP) leader, is heading the PRC. “The question that...Mugabe and his overexcited young wife must be defeated in 2018 elections is no longer a matter up for debate but an agreed goal by all peace-loving Zimbabweans,” he said. Mujuru said both those in and outside Zanu PF should unite and stop the Mugabes whom she claimed are unashamedly running the country into the mud through “primitive accumulation of wealth”. “That Zanu PF has since been turned into private property with the sole proprietors being ... Mugabe and his young wife is there for all willing to see without further debate. NPP urges all peace-loving Zimbabweans to unite and stop this dynasty madness come 2018 harmonised elections. It is only a People’s Rainbow Coalition of ideas that... as Zimbabweans can rescue us from the Gushungo dynasty,” Nyandoro said. A pro-Mnangagwa constituency, the Zimbabwe National Liberation War Veterans Association (Znlwva), yesterday said there was no way Mugabe would win the coming elections if his former deputy joins the opposition ranks. Victor Matemadanda, secretary-general of Znlwva, had this to say: “For Mnangagwa, the option is simple. It is time to forget personal pride. His sacking is a blessing in disguise. We saw it coming but he should swallow his pride and join other Zimbabweans opposed to Mugabe’s rule and the country will be assured that never again shall Mugabe abuse us”. Matemadanda said bygones should be bygones, appealing for unity among those opposed to Mugabe’s rule. “As Zimbabweans, we should learn to forget whatever bad things we did against each other and come together to identify our common enemy and confront him as a unit. “Once we do that, Mugabe should forget about winning elections. This is not about Mnangagwa or personalities but Zimbabweans in general. We should come together and decide on who will be our candidate against Mugabe. “This is only the beginning and if Mugabe thinks that he has won already then he is mistaken. We have fought and won wars before and we are not about to be defeated now. “Let us team up to defeat the enemy,” said Matemadanda. He also called on the international community to “take sides with Zimbabweans” if they are genuine about who has caused the economic decay we are enduring today in this country”. Znlwva chairperson, Chris Mutsvangwa, said by sacking Mnangagwa, the incumbent has raised his (ED)’s political stature “to the point of veneration”. 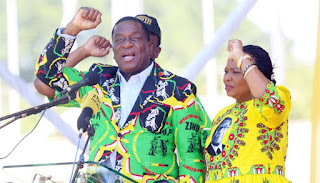 “Thumbs up to the Bulawayo rally, it forced a jaded (Dis)Grace and her senile husband into throwing tantrums before a city and a global television audience. “Masvingo province said all that in the fullness of time: kumagumo kunenyaya,” Mutsvangwa said. He added that Mugabe’s decision was tantamount to one lifting a big stone only to drop it at his feet. “It is now Mugabe versus the people; the sacred G40 (Generation 40) maestro whimpered down to a mere threat. ED has the people,” he said. Mugabe’s wife Grace had been ramping up the pressure on Mnangagwa in the last few months. Matters came to a head at the weekend when Mnangagwa’s supporters booed the first lady during one of her rambling diatribes in which she sensationally claimed that the former Justice minister plotted a coup in 1980. Grace’s attacks were followed by Mugabe, who went on to defend his wife, while attacking his long-time aide. Mugabe even hinted at that rally that he would sack Mnangagwa because his elevation in 2014 had clearly been a mistake.